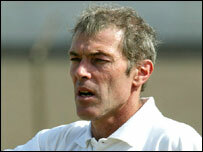 Michel Dussuyer has confirmed he has signed a two-year contract to coach Benin. The Frenchman replaces Wabi Gomez, who was the stand-in coach following the resignation of Reinhard Fabisch because of health problems in May. Dussuyer spent two years in charge of Guinea, taking them to the quarter-finals of the 2004 Africa Cup of Nations in Tunisia. The former goalkeeper took a brave decision to stick with the veteran Titi Camara, when the legend of Guinean football appeared well past his best. Camara repaid that faith by scoring three key goals in Tunisia. Other than his spell with Guinea, Dussuyer also worked as a scout for Ivory Coast in 2006, and had an unsuccessful spell as coach of French club Cannes. The 49-year-old is a laid-back man, but was occasionally frustrated by the challenges of coaching in Guinea, one of the most disorganised nations in African football. He will hope for less chaos in Benin, a country with fewer talented players than Guinea, but one that has qualified for two of the last three editions of the Nations Cup. Benin are currently second in Group Three of the combined 2010 World Cup and Nations Cup qualifiers. After a 3-0 defeat away to Angola, they beat Uganda 4-1 in Cotonou.